Udupi, Apr 22, 2017: Chief Minister Siddaramaiah said on April 21, Friday inaugurated Sri Barkur Maha Samsthanam at Barkur, in Udupi district. The 12th century philosopher and social reformer Sri Basaveshwara, the saints, the “sharanas” and the “dasas” had explained religion and its tenets in simple language which people could understand. 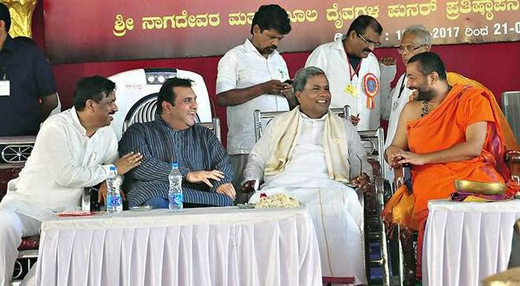 The CM pointed out, speaking after inaugurating the Sri Barkur Maha Samsthanam. Caste discrimination should be shunned. “God has never discriminated anyone because of his or her caste. Hence it was wrong for people to do so against their fellow beings,” he said. The Bunt community was progressive as it followed the matrilineal system. The people of this community were also adventurous. When they lost lands during the land reforms, they went to Mumbai, Bengaluru, the Gulf and so on and made a name for themselves in different businesses and professions. The members of this community preferred to create jobs rather than search for jobs. It was apt that the Sri Barkur Maha Samsthanam had been established here. It was here that the legendary King Bhootala Pandya ruled. This place once had 365 temples. Four persons were presented with the Bhootala Pandya Awards. They are: N. Santosh Hegde, former Lokayukta, Jaya C. Suvarna, President of Billava Mahamandal, Shashikiran Shetty, businessman, and K. Chinnappa Gowda, scholar. Cast discrimination should be shunned....... Then why various bhagya scheme on caset/religion lines...? Heluvudu shasthra.....ikkuvudu gaala...! Various sadhus and saints too managing their empire on caste/religion line4s...!